Today I met with a small group of youth who are interested in starting up a Youth Choir for Skibbereen. We sang a few songs and shared ideas. The hope is to operate from the new West Cork Arts Centre premises once it opens in the New Year. I am looking at two groups: 8-11 years and 12-16 years…..ish! So spread the word…….Posters and further promotion will be on it’s way shortly!! when they stopped the fighting “and they were one-A spirit stronger than war was working that night” in December 1914. I am going to be following this project and am developing the idea of a cross generational project here in Ireland on the back of it. Any other community musicians interested please get in touch. Many of the choirs are singing the same songs, including “Only remembered”, but there are also words, poems and songs from stories told by local people. Being a member of the Natural Voice Practisioners Network based in England helps to keep me posted on activity across the water there. I am keen to encourage and support Ireland in the development of forging stronger links between community artists of all mediums, organisations, and the public at large in the wonderful work we do where we are supporting others to connect to theirselves, each other, and to the environment surrounding us. Here is a post I received today which I’d like to share. The Workers’ Educational Association West Midlands has been running a 12-month research project on singing for wellbeing, in conjunction with the University of Oxford, to explore the impact of adult education singing classes on students’ health and wellbeing. Several NVPN members have been involved in this, and the project has now produced a 6-minute YouTube clip, which is well worth watching. 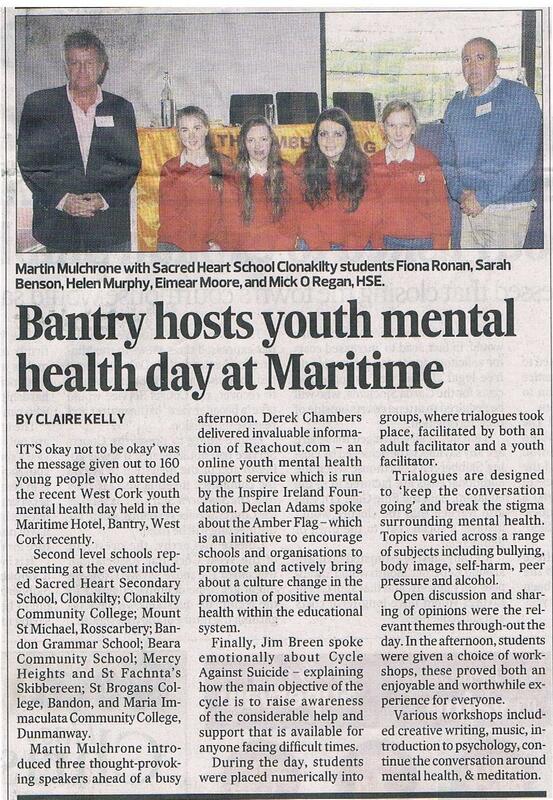 On Tuesday 7th October ’14 I was delighted to be involved with this event marking Youth Mental Health Day. I had a great group of 23 youngsters from different schools who joined me for a creative music making session. Complete with drums and other items of handheld percussion, we explored rhythms and voice based around the song “Let’s get it started”, by the Black Eyed Peas. Although we found ourselves in a somewhat ‘squishy’ space and had to remain seated throughout the duration of the session, we still managed to have great fun incorporating body percussion rhythms as well as hand held instruments.